If you have been involved in a car accident and have suffered injuries or property damages, then you understand how it can be a frustrating time both physically and psychologically. Because this difficult time can make so many areas of your life more complicated and unpredictable, you need a clear-headed, skilled and experienced Massachusetts and New Hampshire car accident lawyer in your corner. 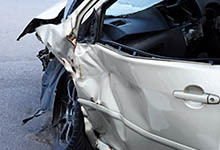 George C. Malonis is the trusted Massachusetts and New Hampshire accident lawyer for the job. Dealing with insurance companies is not something anyone should take on alone, especially when it comes to negotiating a settlement. After an accident, insurance companies will try to get you to agree to a settlement as soon as possible. Often, these offered settlements are far less than you need to deal with the financial ramifications of the car accident. They may even try to secure a settlement agreement before you even realize the full scope of your injuries. As a skilled personal injury lawyer with over 20 years of experience, George C. Malonis will not let the insurance companies get away with persuading you to accept less than what you need and what you deserve. Our firm will fight for your rights and protect you from being taken advantage of. Massachusetts is a compulsory insurance state, which essentially means everyone needs the minimum coverage. However, this minimum coverage may not be enough to cover serious injuries or damage. If left injured, you could also be left with staggering medical bills, rehabilitation bills, lost wages and other expenses resulting from the car accident. At the firm of George C. Malonis, you will have an advocate who will make sure your needs are met and the law is upheld. Even if injured by a non-insured party, coverage for damages may be available through an individual’s own auto insurance carrier. Our firm does more than negotiate with insurance companies. To get you the settlement you need, we gather evidence that supports your case, gather the necessary documents, interview witnesses and investigate the scene and the facts of the case so we can put forth a comprehensive plan to prove your case. When you have been involved in any kind of accident, whether a car crash, truck accident or motorcycle accident, and there is clear fault, or there is a police report of the incident that you don’t agree with, do not hesitate to contact George C. Malonis. Especially if the damages exceed the limits of insurance or if the accident is serious enough that there may be permanent injury catastrophic injury or disability. With us by your side and in your corner, you can rest assured that your Massachusetts car accident case will be handled as expertly as possible and in a timely manner. We will take the time to get to know you and do everything in our power to protect you from further victimization. A car accident can be life-altering as you try to put the pieces back together. With the experienced negotiating and litigating skills of the law firm of George C. Malonis as part of the process, your voice will heard and your rights will be diligently protected as you move on from the incident.